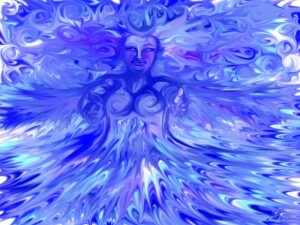 Yemaya is the mother of all life on Earth. All life came from the water and requires water to live. 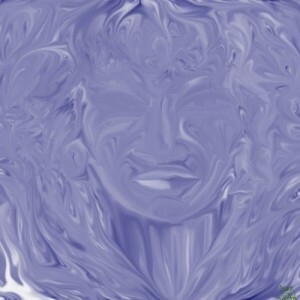 She appears to human eyes as a mermaid, and this is how she is usually represented. This hearkens to her perceived form from Mami Wata. The Mami Wata are ancient African deities that were depicted with human upper bodies and fish or snake-like lower bodies. Some people who don’t get the history conflate Mami Wata with Yemaya and/or Olokun, but they were only two of many. The reason for the confusion is likely that there is art representing both the Mami Wata in general and individual Mami Wata deities. So many think that Mami Wata is one individual Goddess, which isn’t a total crime as it just comes from ignorance. However, the danger in this as with any strictly monotheistic religion is that it is a slippery slope to believing one’s god as willing to override nature on one’s behalf, and then one’s self as above nature and then above the Creator by virtue of following an imaginary thought police. Another common bit of misinformation is that Yemaya is the Mother Goddess as in the feminine aspect of the Creator. This is not so. Yemaya is a created being; a child of the Creator(s) Olorun and Odudua. Even these are only the infintessimally small fragment of what mankind can possibly understand about the Almighty. In fact, there are serious limits to what we can possibly understand about any of the child deities or Orishas. We barely get our own Ori. Some also say that originally, Yemaya was the Goddess of one river, and eventually became so well regarded that she was thought to be the Goddess of the Sea/Ocean. Traditions vary, and there are many versions to the story of Yemaya. So, to come to awareness of Yemaya, one must be humble and realize their humanity. Go out and look at the ocean or sea or river or a spring. Watch water. It is beautiful and it is life. It is our Mother on this Earth. Being the Orisha of waters and also our Mother, you should bring offerings to her to bodies of water. If you are unable or need to be discreet, you can make a small pool by digging a hole and pouring water in, or by getting a tub or bowl of water. If you must use a bowl or tub, it should be blue or white or some combination of it, and it is best if this has not been and will not be used for other things. If should be made of clay or natural ceramic material. The water should be rainwater or seawater if you can get it. If not, tap water will do, but sprinkle some gray salt or other natural salt in it. She enjoys white flowers, seaweed, sea shells, and white wine. Some say she likes seafood, but I’d tell you to follow your instincts in this. She definitely likes melons and very juicy, light fruits. She likes it when you do good things for the environment. You should minimize your use of plastics, and recycle them whenever possible. If you don’t have a recycling program in your area, you should have some way to get plastics to where they can be recycled. There are companies that use plastics of any kind to make railroad ties and other things. Find out where your local environmentalists have pick up points. Just don’t let your computer end up being inhaled by some African or Indian child, or your bottles end up choking a shark to death. Yemaya also likes it when you do nice things for parents and children. Babysitting for free occasionally so that a parent of a baby can get some much needed sleep is a very good thing. Anything you can do to assist mothers, fathers, and children is a gift to Yemaya. One very important thing that many people in the African diaspora need is education on a proper diet. The typical western diet is killing us badly enough, but even worse is what is considered a “healthy diet” in the west. Africans and mixed African and Native Americans should be taught how to eat properly according to our needs. Teaching Yemaya’s children how to feed themselves blesses them and blesses you. This oil should steep in a cool, dark place for 3 months. Some find the more traditional versions of Yemaya oil (some have fish oil in them) a bit unpleasant. There is a less traditional modern version using essential oils that is prettier smelling yet reminiscent of the sea and life. After doing the appropriate ritual, mindfully add these ingredients to a 10 ml. vial and give it a few good turns. Consecrate and wear as a devotion or dress candles with it. Pound the ingredients together, starting with the coffee beans or English peppers, in a mortar and pestle until they are as fine or as chunky as you prefer. mama, mami uatur, mami wata, momi, mother, mother goddess, mother of ogun, mother of orishas, mother of oshun, mother of shango, mother of water, mother orisha, motherhood, nana, nana burku, nana buruku, nurturing, ocean, river goddess, sea, water, water goddess, yemanja incense, yemanja oil, yemaya, yemaya incense, yemaya incense recipe, yemaya oil, yemaya oil recipe, yemoja, ymoja. Bookmark. Though I never made it to Santo, Yemaya is my head. I love her dearly. She has let me make my mistakes. Trust root workers who did not care for me. She is always there for me. I take her watermelons to the Ocean sometimes. I think of her daily. She has given me everything I need, not wanted. Yemaya saved my life in so many ways, protected me from those who wished me harm, saved me from being homeless or without food. She is generous and loving, a Mother to me. I am honor that she choose me to be a child of hers. I thank her for all of her love. I love her dearly. I call her Mama. She is my Mother, I cried with her and celebrate with her. She blesses me. Sometimes we forget how much Orisha loves their children. They love us. Yemaya loves me, for all of my faults, protects me from all harm. I love her for being so loving with me, caring for me, letting me suffer to learn my lessons. On a path to Santo there a bumps in the road, but I have learned that Yemaya is there for me, all the time, pushing me to do my best in all I do. A resource site for those few Pagans who specialize in water-based magick and worship of Sea Gods.